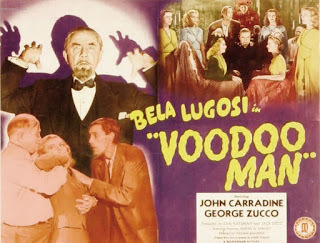 Having gained a temporary reprieve from his Monogram Nine contract to do Columbia’s marginally better Return of the Vampire (1943), Bela Lugosi was soon back to hacking away at the coal-face of crapness on his last two contractual obligations. 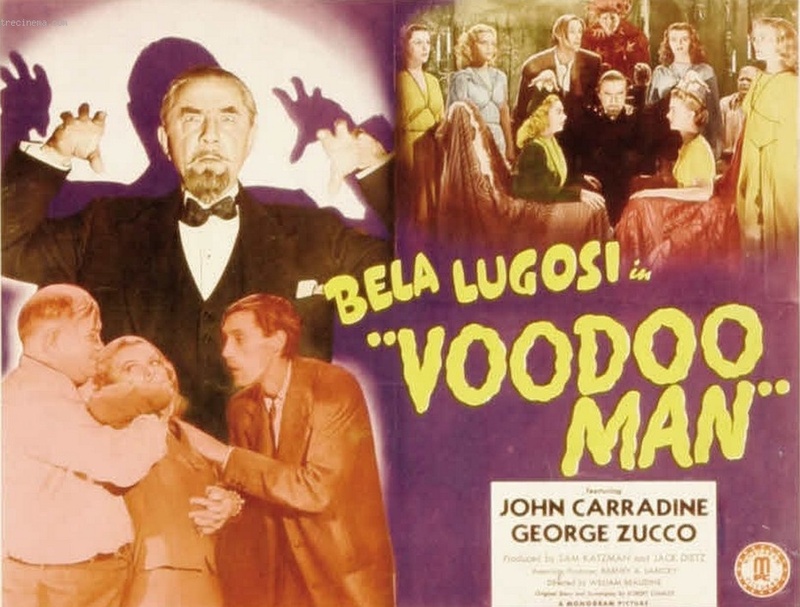 The next released (but filmed second to complete the Nine) was the dull and dreadful Voodoo Man, whose only saving grace was a chance to see him teamed up with two other noted horror actors George Zucco and John Carradine. However, here his co-stars are only required to be one-noted which somewhat scuppers the definition of value for money. 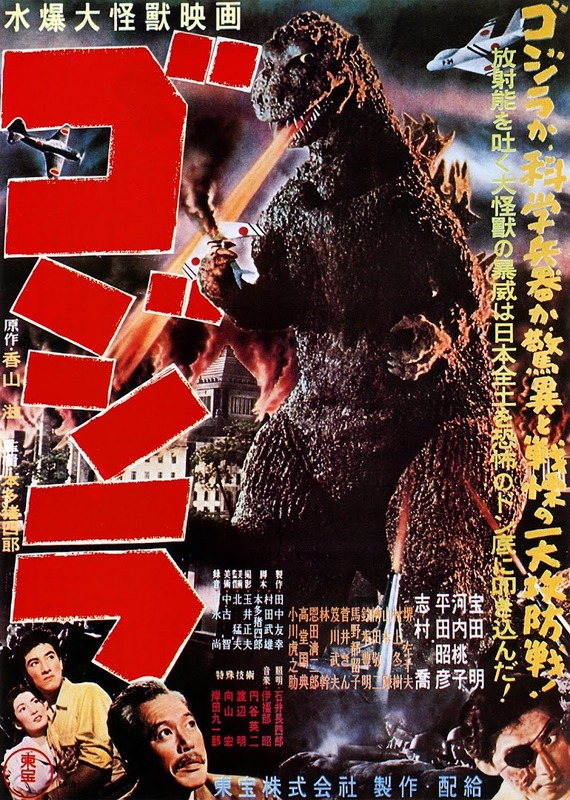 Once more, producers Sam Katzman and Jack Dietz assembled a script, cast and crew in the same way a toddler assembles playpen bricks though without any of the eventful results. Our old friend William ‘One-take’ Beaudine directed again, still proving as we will see that as long as the players are alive and making vaguely coherent sounds before the camera, that’s good enough to move onto the next location. The tragic excuse for a plot and dialogue is passable in the same way as a kidney stone – invisibly and painfully. The writer Robert Charles was only credited with one other screenplay, the same year’s infamous and very rare Return of the Ape Man (filmed just before Voodoo Man). I’ve been ‘lucky’ enough to acquire this and will be reviewing it soon for your questionable benefit. Lugosi plays the Lenin-bearded Dr Marlow, a variation on his gallery of urbane and insane mesmerics that by now took no more energy from him than a screensaver. 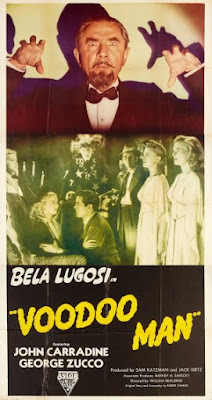 He is engaged in abducting beautiful young women not for the old chestnut of sinister research, but the equally over-used warhorse of reviving his wife’s suspended animation, which at least allows him the extra inspiration of spousal grief he channelled in 1934’s The Black Cat (reviewed here) amongst others. It could be worse, he could be George Zucco. (You know you’re in for a rough ride when the normally better-appointed Zucco takes a poor second to him in a horror movie). The seemingly indestructable High Priest of Universal’s The Mummy sequels had some down-time before one last burn of the incense in The Mummy’s Ghost (1944). Here as Nicholas he begins by serving as a gas station look-out alerting fellow conspirators of incoming potential victims before . The first prey we see is Alice (Terry Walker) whose exit is given Zucco’s beady-eyed stare of intent before he reaches for the ‘phone. Competing for the title of MUVP (‘Most UnderValued Player’) is John Carradine as one of the two henchmen. Following his brace of mad scientist roles in 1943’s Captive Wild Woman and Revenge of the Zombies (reviewed), the talent that gave us Jim Casy’s hobo preacher in John Ford’s poetic Grapes of Wrath (1940) has to make do with being a scrawny simpleton in the employ of Dr Marlow. He would spiral even further down the lurid funhouse slide of bad movies in the future. Along with Pat McKee’s Grego, he sets up road diversions luring the ladies into nebulous medical experimentation. Meanwhile Ralph (Tod Andrews) is a Hollywood screenwriter visiting his boss at the Banner Motion Picture Company – yes, the same firm who in real life made these jalopies for Monogram. To further the in-joke, his boss S.K. (John Ince) shares the same initials as producer Sam Katzman. The newspaper coverage of these victims’ disappearance piques S.K.’s interest as a movie idea, inexplicably so since the article literally only states that three have vanished that month along with their cars. “Some kind of horror story” he suggests. Presumably from such soggy clay are Monogram sculptures thrown together. Ralph is luckier in his coincidental meetings than in his employment. On his way to see his fiancé, he runs out of gas and is picked up Stella Saunders – another spunky role for Louise Currie after her sassy photographer in The Ape Man (1943). She just happen to be his fiancé’s cousin. When her car breaks down, Stella is kidnapped by the redneck henchmen while Ralph goes to that same house to use their ‘phone for help, thus ending his run of freakish good luck. Stella and Ralph now find themselves embroiled in the bizarre cult shenanigans of Marlow and Nicholas, who are attempting to find a suitable “girl with a perfect affinity” to mentally link with Marlow’s wife Evelyn (Ellen Hall) thus reviving her from a twenty-two year catatonic state. Nicholas is convinced that the goddess he worships holds the key - “But remember- Ramboona is all-powerful!” She’d need to be as the three-stage process they must undergo to invoke her is bafflingly funny. 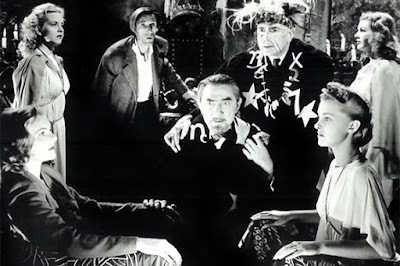 Lugosi sits between wife and captive subject Stella intoning vague nonsense about “Emotion to emotion. Life…to death” (recalling Spock’s strangely touching “My mind…to your mind” in his superior Star Trek mind-melds). Meanwhile McKee and Carradine sit in on bongos. (At one point a shot of the latter’s whacked-out banging suggests what he’s channelling instead is a Woodstock hippie who touched the brown acid). The worst casualty though is Zucco. From this point on, Nicholas is a embarrassingly attired, laughably threadbare gobbledigook-spouting version of his aforementioned Universal role. He and Lugosi both sport comedy sketch ceremonial occult robes: black silk adorned with stars and a large obviously symbolic ‘7’ - less The Devil Rides out and more The Wizard of Oz - that couldn’t telegraph more obviously if they advertised ‘I’m up to no good’ on the back. Poor George suffers the even greater indignity of a leopard-skin bandanna topped with a crazy frightwig and a child’s Red Indian face-paint. There are so many interminable inserts of his satanic mumbo-jumbo delivery at the altar that he’d have been better off turning in into a cash bar for fun and profit. Dr Marlowe grows increasingly frustrated that he can’t find a woman with the right spiritual faculties to bring back Evelyn to him. She is so delicate, bless her, that he warns his sinister housekeeper Mrs Benton that “A sudden bright light will disintegrate her”. Someone should tell cinematographer Marcel Le Picard since in every scene he bathes everyone in strong lamps, most noticeably when Lugosi is shown doing his Svengali mesmerism. His face is often almost clown-white in close-ups under a generalised light blast. There is no need to compound the confusion by delving too deeply into the remaining dregs of plot. Ralph reunites with fiancé Betty (Wanda McKay) and they become amateur sleuths getting to the remarkably shallow bottom of the mystery disappearances. They rescue Stella from post-experimental wandering in the forest, prompting Betty to observe “You know, I’ve seen people act like that in pictures. What do they call them? Zombies or something?” Before we can remark about the alternate name of ‘contract players’, the coincidence hits keep on coming as Dr Marlowe is brought in to examine Stella. Gleefully, they have played into his hands by presenting him with his missing victim, albeit with such a layman’s recommendation of bed-rest that it isn’t long before the couple suspect him of foul play. That’s just as well as Marlowe has Nicholas remotely hypnotise Betty into coming to him as a much more promising catalyst for Evelyn. The virtual Miss America pageant of four lovely women kept on hand in the basement and pawed over by the babbling Carradine shows that even Monogram had access to the deluge of young hopefuls continually bussing into Tinseltown. Mind you, looks will only get you so far. When the Sheriff (Henry Hall) finally shoots Dr Marlow dead, the awakened version of Evelyn is just as sleepy as the catatonic one.